Chia is naturally gluten-free and can be added to many recipes to help gluten-intolerant people get the nutrients they need. Plus, the milled form of chia can sometimes be used instead of flour, so it’s a great alternative. In a large bowl, combine the oats, chia, coconut, and almonds. Mix in the brown sugar, ginger, cinnamon, and salt. In a small saucepan, heat the coconut oil over medium heat for about 3 minutes, until it melts completely. Add it to the mixture. Mix in the agave syrup and almond extract and mix it very well. Brush the mixture with the egg whites. Bake for 10 minutes, remove from the oven, and stir on the baking sheet. Return to the oven for another 20 minutes or until golden brown. Add the cranberries and transfer to an air-tight container. Per serving: Calories 1,250 (From Fat 544); Fat 61g (Saturated 27g); Cholesterol 0mg; Sodium 484mg; Carbohydrate 163g (Dietary Fiber 27g); Protein 25g. You can add whatever berries you like, or try mixing more than one — such as raspberries and strawberries. 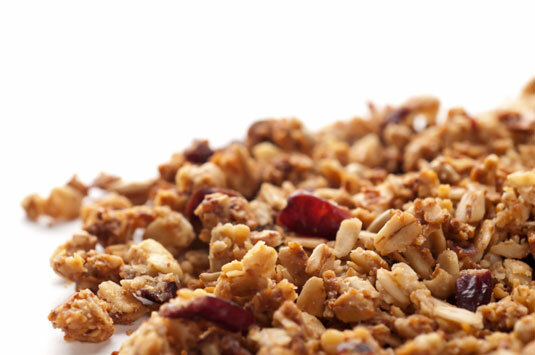 You can make this granola vegan by leaving out the egg whites. Heat a frying pan on low. In a large bowl, add the brown rice flour, baking powder, and salt. Mix together. On a plate, mash the banana; add the chia seeds and mix. Add the banana and chia mixture to the dry mixture and combine. Add the egg, almond milk, and vanilla extract to the mixture. Mix well to ensure an even consistency. Add the berries to the batter and mix well. Add some butter to the pan and place 1/4 cup of the batter onto the pan. Flip and cook the other side, until brown. Repeat to make the remaining pancakes. Per serving: Calories 116 (From Fat 29); Fat 3g (Saturated 1g); Cholesterol 27mg; Sodium 91mg; Carbohydrate 19g (Dietary Fiber 2g); Protein 3g. If you find it hard to get rice flour, you can use spelt flour. Just be sure to read the label to make sure it’s gluten-free. Try adding fresh berries and maple syrup. Just make sure to read the label to make sure it’s gluten-free. Prepare a pot of boiling water and cook the rice per the package instructions. In a large pan over low heat, put the oil, cardamom, cinnamon, crushed cilantro, cumin, and turmeric; cook for 1 minute. Watch to make sure the spices don’t burn. Add the onion and cook for about 3 minutes. Add the garlic and ginger, and cook for 1 or 2 minutes more. Add the chicken, coat it in the spices, and cook for a few minutes. Add the coconut milk and bring the liquid to a boil. Reduce the heat and let simmer for 8 to 12 minutes. The chicken will be tender and the liquid will reduce. Add the yogurt and cream to the mixture, making sure it doesn’t boil. Sprinkle the chia, almonds, and fresh cilantro over the mixture. Serve the rice and add the korma either on the side or in the center of the rice. Per serving: Calories 901 (From Fat 477); Fat 53g (Saturated 29g); Cholesterol 116mg; Sodium 120mg; Carbohydrate 69g (Dietary Fiber 7g); Protein 40g. Korma is a dish that originated in south or central Asia. It’s usually made with yogurt, cream, nut and seed pastes, or coconut milk. It’s often the less fiery choice of curry dish because it’s usually made with less chilies, but it’s still full of flavor.